You can set your Inbound Channels to renew automatically month after month and charge the renewal cost to your available account credit. Once set, these auto renewals happen 7 days before the expiry date of your Inbound Channels if sufficient credit to pay for the renewal cost is available in your account credit. On auto renewal you will get an email informing you of the completion with a link to the auto generated invoice. Set your Inbound Channels to auto renew to relieve yourself of manually renewing them. 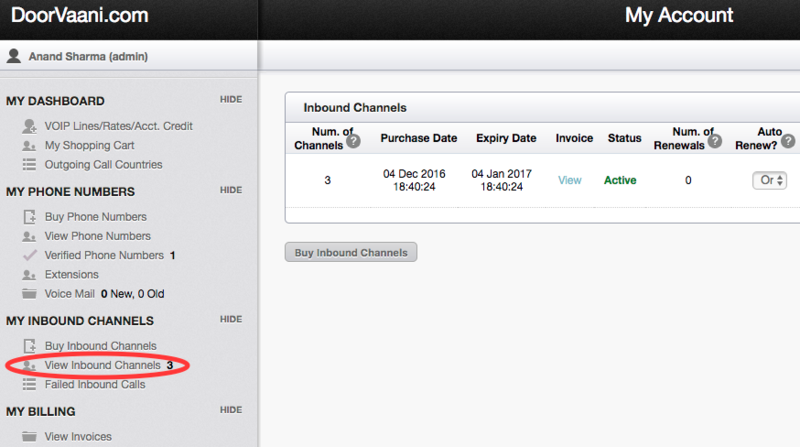 This article explains how to set auto renewal of your Inbound Channels. Please log in into your DoorVaani account, if not already logged in, and then click on the “View Inbound Channels” menu under “MY INBOUND CHANNELS” on the left hand side. Please see the below image. In “View Inbound Channels” page, please see the “Auto Renew?” column of drop-downs with options to set the Auto Renew to “On” or “Off”. Please select the option “On” and say OK to the confirmation message. This will set your Inbound Channels to renew automatically provided you have sufficient credit available in your DoorVaani account. Just in case you do not want the auto renewals you can come back to this page at any time and set the Auto Renew to “Off”.